According to New York Times, Philippine President Aquino III compared China’s claim of sovereignty over some tiny disputed islands and reefs to Hitler’s claim of Sudetenland and asked the international community for support to prevent China from taking the disputed islands and reefs. He gives the implied comparison of the international community’s failure to support the Philippines to the rich West’s failure to support Czech against Hitler’s demands for Czech land in 1938. True there was the notorious Munich Conference of appeasement, but there is no international conference on those islands and reefs now. Moreover, the Philippines has applied for UN arbitration regarding to the islands and reefs and the arbitration award has not come out yet. How can Aquino regard the islands and reefs as Philippines’ and accuse China as an aggressor like Hitler before there is an arbitration award that supports Philippine claim of sovereignty over those islands and reefs? Does he mean that UN commits appeasement if UN arbitration award is in favor of China? 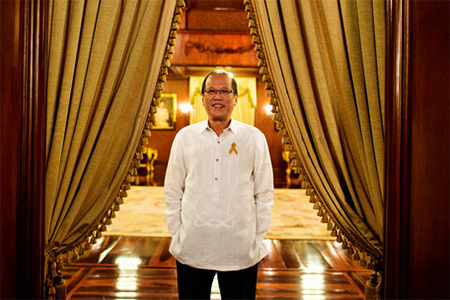 The Philippines is a member of the ASEAN, but it seems that Aquino has not got support from ASEAN for his claim. Does he mean that ASEAN is committing appeasement in failing to support the Philippines? It is a pity that he has little international support. Does that prove Chinese sage Mencius famous saying “A just cause enjoys abundant support, while an unjust one finds little support”? A prominent Chinese academic says Beijing could withdraw from the UN’s maritime treaty rather than submit to judgment on its disputed sovereignty claims in the South China Sea. Regional security expert Professor Shen Dingli said the decision by the Philippines to refer its territorial disputes with China to UN arbitration demonstrated that it was “a mistake” for China to have joined the United Nations Convention on the Law of the Sea (Unclos) in the first place. Shen, deputy dean of Fudan University’s Institute of International Studies, was speaking on the sidelines of a forum last week in Manila, entitled “What is to be Done? Resolving Maritime Disputes in Southeast Asia”. He said that “how to make China not quit the treaty is in [the Philippines’] interests”. Giving what he said was a personal opinion, Shen said the Philippines had blundered by going to the UN International Tribunal on the Law of the Sea to seek judgment on the validity of China’s “nine-dash line”, through which it claims most of the South China Sea. That claim is disputed by the Philippines, among other nations, and Manila filed the UN action in January. “The more you sue China, the more China would [want to] quit the treaty. [In that event, China] would never abide by the treaty, and [the Philippines would] have no international base for China to observe any more,” Shen said. He said there were four ways available to settle the dispute: war, the UN tribunal, bilateral negotiations, and mediation by a third country. He said he advocated what he said was a win-win solution. Manila’s action before the UN tribunal was a hot topic at the conference hosted by the Angara Centre, a private think tank created by former Philippine senator Edgardo Angara. Dr Ian Storey, a senior fellow at Singapore’s Institute for Southeast Asian Studies, said “China is furious” at Manila over the case. He said that China had tried to humiliate and isolate Philippine President Benigno Aquino by effectively withdrawing an invitation to a China-Asean trade fair in Nanning in September by saying “Oh, by the way you can only come if you withdraw your suit”. Storey suggested that Asean and China should strike an “incidents at sea agreement” similar to that established between Russia, Japan, South Korea and Western countries in the 1980s. He said Manila should be prepared for the possibility that the UN tribunal would decide not to issue a ruling because it might damage Unclos. He said the tribunal was likely to have dealt with the suit by 2016, the year Aquino steps down. Philippine Supreme Court Associate Justice Antonio Carpio, a guest at the forum, said it would be “horrible and a tectonic disaster” should a new president drop the case against China. “That means … admitting that our position is weak,” said Carpio, who wrote the Supreme Court ruling that Philippine territorial claims in the South China Sea were constitutional. Carpio, who was a presidential official when China seized Mischief Reef in the mid-1990s, rejected Beijing’s assertions that Manila had refused to negotiate. A separate symposium by the Philippine Association for Chinese Studies was also held last week on the same topic. The Philippines expects an early ruling from the United Nations’ tribunal on its arbitration case questioning China’s claim on the South China Sea, Manila’s foreign minister said on Thursday, in the first public announcement of hopes for a swift outcome. Friction over the key shipping route has surged as China uses its growing naval might to assert a vast claim over the oil-and-gas rich area more strongly, raising fears of a conflict with other nations bordering the water body. China, Taiwan and Vietnam have claims on the whole of the South China Sea, while Brunei, Malaysia and the Philippines claim only parts of the disputed waters. Foreign Secretary Albert del Rosario said the Philippines initiated arbitration proceedings this year after exhausting all political and diplomatic avenues of resolution, and called China’s claim on the South China Sea “expansive and excessive”. “Our lead counsel believes that without China’s participation, the award will come down faster and may come down by 2014,” del Rosario told a group of diplomats and chief executives of top private and public corporations. “This is a positive development,” he added. Del Rosario earlier told Reuters that going by previous cases, the arbitration case could take three to four years to resolve, insisting the tribunal’s decision “will be legally binding on all parties and will not be appealable”. Legal experts say any result will be unenforceable, however, though it will carry moral and political weight. 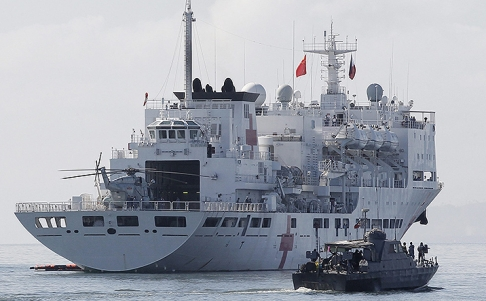 China says it has no intention of participating in the case, which it has called an attempt by Manila to legalize its occupation of Chinese islands in the South China Sea. Del Rosario also accused China of violating international laws and a non-binding pact in the South China Sea between China and 10 smaller Southeast Asian states, after sending ships to the Scarborough and Second Thomas Shoals. 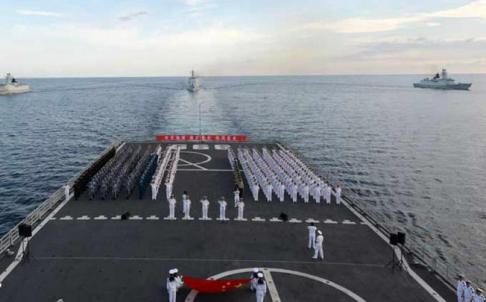 “China’s continuous overwhelming naval and maritime presence in the area is also contributing to the raising of regional tensions,” del Rosario added. He said Manila had until next March 30 to submit its arguments and evidence seeking clarification on China’s maritime claims, based on the U.N. Convention of the Law of the Sea. A diplomat familiar with the arbitration proceedings told Reuters the tribunal would give China six months to respond before holding a hearing and deciding the complaint. “So, we could actually get an actual ruling by late 2014 or early 2015,” the diplomat said, adding it would take time if China changed its mind and decided to join in. China accused the Philippines on Friday of trying to legalize its occupation of islands in the disputed South China Sea, repeating that Beijing would never agree to international arbitration. Frustrated with the slow pace of regional diplomacy, the Philippines in January angered China by asking a U.N. tribunal to order a halt to Beijing’s activities that it said violated Philippine sovereignty over the islands, surrounded by potentially energy-rich waters. Manila said on Thursday that a U.N. arbitration court had set up the tribunal which would hear Manila’s complaint, but China said this was an attempt to steal Chinese territory. “The Philippine side is trying to use this to negate China’s territorial sovereignty and attach a veneer of ‘legality’ to its illegal occupation of Chinese islands and reefs,” the Foreign Ministry said in a statement on its website (www.mfa.gov.cn). The Philippines must immediately withdraw personnel and facilities from the islands, the ministry added, listing those which it said Manila was occupying. Manila asked the tribunal of the U.N. Convention on the Law of the Sea (UNCLOS) to order a halt to China’s activities. But the convention did not apply in this case as what the Philippines was actually asking for was a decision on sovereignty, the ministry said. “China’s refusal to accept the Philippines’ request for arbitration has full grounding in international law,” it said. China had always believed that the two countries should resolve their dispute through direct talks, the ministry added. Southeast Asian nations stepped up efforts on Thursday to engage China in talks to resolve maritime tensions, agreeing to meet to try to reach common ground on disputed waters ahead of planned discussions in Beijing later this year. Efforts by the Association of Southeast Asian Nations (ASEAN) to craft a code of conduct to manage South China Sea tensions all but collapsed last year at a summit chaired by Cambodia, a close economic ally of China, when the group failed to issue a closing statement for the first time.